LANCASTER – A man named by the coroner’s office as the person whose body was found last month in a cistern at an abandoned home in the Lancaster area is in fact alive, but is still missing from a halfway house and off his medication for mental illness, his worried mother told reporters. The case dates back to July 2 when sheriff’s homicide detectives were sent at 9:20 a.m. to the area of 220th Street East and East Avenue F.
A detective told a news photographer at the scene that a burned body was found inside a water cistern at an abandoned house. Lancaster deputies confirmed the find and notified the homicide unit, Lugo said. The Los Angeles County coroner’s office identified the decedent as 26- year-old Adam Buckley, but it turned out the identification was made in error and Buckley was still alive. The coroner’s office issued a statement explaining that its staff was unable to get fingerprints or bone DNA from the body because of extensive thermal damage. 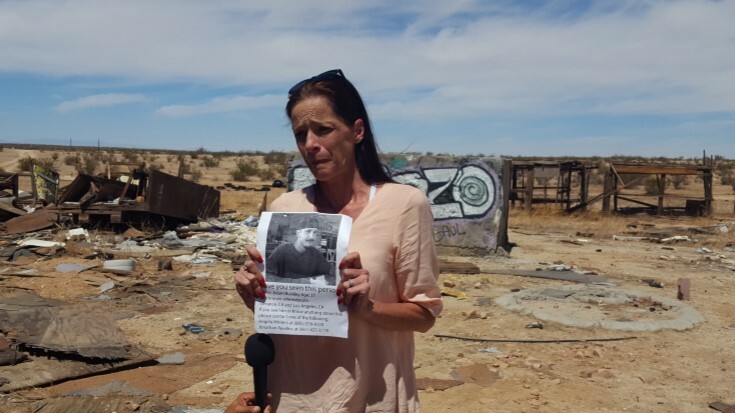 On July 26, the sheriff’s department contacted the coroner’s office to say the body could possibly be that of a missing person – Adam Buckley. “Less than three weeks later, our board-certified radiologist compared body X-rays known to be of Mr. Buckley with body X-rays of the decedent and, based on the information known at that time, confirmed the identification for LASD,” according to a coroner’s office statement. The coroner’s office notified Buckley’s legal next of kin of the match, but on Tuesday, officials were informed that Buckley had been located and was alive. It turns out, Buckley had been incarcerated for vagrancy and was released in Torrance several days ago, his mother said. “Additional tests are being run on the body, including DNA found in a muscle,” according to the coroner’s office. The test results are pending, but officials have no leads on the decedent’s identity and the cause and manner of death remains unknown. “As forensic tools and strategies continue to be developed, we are reevaluating our processes in identification to help keep incidents like this from happening again in the future,” officials said. “These types of mistakes are unacceptable to us and run counter to our mission of looking after and protecting the decedents of Los Angeles County. We are committed to making improvements wherever they are warranted,” according to the coroner’s statement. Anyone with information about the once again unidentified body is encouraged to call the Sheriff’s Homicide Bureau at 323-890-5500, or Crime Stoppers at 800-222-TIPS. 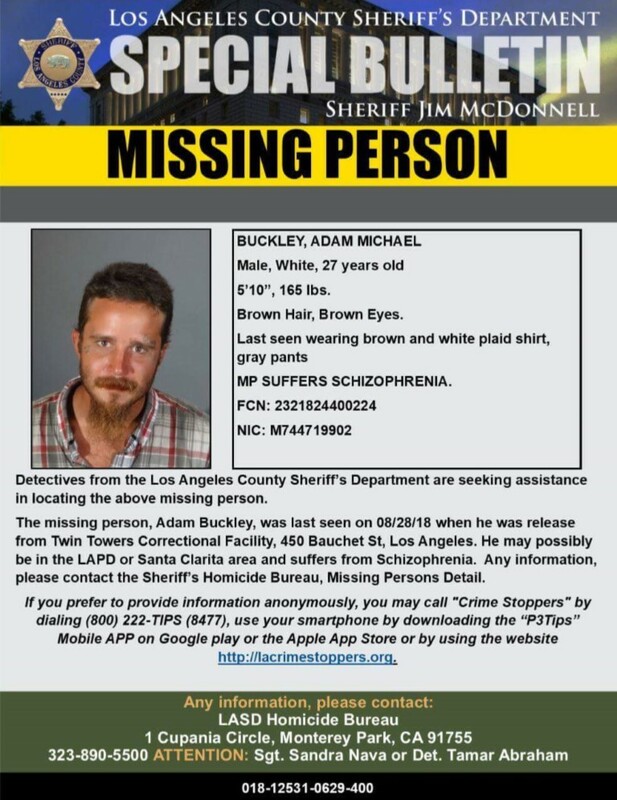 Anyone with information on the location of Adam Buckley is encouraged to contact the Sheriff’s Homicide Bureau, Missing Person Detail at 323-890-5500. UPDATED 9/11//18: Adam Buckley has been found, he is getting the care he is needs, and he will soon be reunited with his family, according to sources close to the case. 30 comments for "Mother searches for son falsely identified as dead [update: found]"
The U.S. Postal Service uses zip code 93535 with Lancaster, Redman, Hi Vista, Roosevelt Corner, Wilsona Gardens, and a small portion of Lake L.A..
Adam Buckley went missing from a halfway house in June. He was arrested on August 25th in Torrance on suspicion of vagrancy, then he was released from jail August 28th. I checked, and he had two booking numbers. the second booking number said he is at TTCF as of 9/12/18. Two felonies (no bail), as you said. and BTW, he has mental illness and did not even know any of this was happening. Be grateful that you are alive and well enough to make snarky remarks about a situation you know little about. Wrong genius. Mental illness is caused by a combination of genetic, biological, psychological, and environmental factors. True, some drugs cause mental health issues. But more than that, mental health issues cause substance abuse issues. Maybe you should check your facts before popping off like a five dollar shotgun. smh Perhaps that’s just what caused YOUR mental illness? I speak from experience. My EX did no drugs when I met her, these days she is an everyday (more like every hour) meth user and now she has no patience for anything, she becomes mean and nasty at the drop of a hat and has developed OCD. The problem is that once a person becomes severely mentally ill, their answers become unreliable and nobody is in a big hurry to document their cases anyhow. Example: The old woman I met at a bus stop on Palmdale Blvd. and 17th east, Rambled on about all the agency’s out to get her, the DMV, the Post Office etc… she was living out of 3 shopping carts parked behind the bus stop and I got to know her well enough to where she admitted to me that she had been on meth for years. Has she been documented? No. I am certain that drugs have caused more mental illness in today’s society then any other cause, I just cant prove it on paper due to lack of documentation. And yes, google does work.. I looked up “popping off like a five dollar shotgun” and came up with nothing.. where in the world did you come up with that? Check urbandictionary.com in a day or so. No, really. Check it. A chicken and egg problem…homelessness, substance abuse, mental illness…hard to tell the causes from the results in that trio, and probably not going to get any consistent result when you can say which came first. Dear Some Guy, no she does not look like she is “on dope” you jackass. That picture was taken after weeks of grief and lack of sleep had taken a toll on her. She lost over 15 pounds in less than a month. And for you others. ADAM HAS BEEN FOUND! He will be okay and he is getting care. And he was never missing, He’s 27 and doing whatever he wants and going where he wants. got my photo in the paper 10 years ago. Folks thought I looked like I was a drug addict. Some people just don’t take good pictures. I feel sorry for her..but take a close look at her.. does she not look like she is on dope? But that does not diminish a mothers love for her kid. I suspect he does not want to see her, she does not look like she had any chance to win the Nobel Prize for Parenting. Perhaps he blames her for his bad childhood. Do you always judge the book by the cover? Bad habit to get into as such assumptions can be hurtful AND embarresing. No, some guy. She looks nothing like she’s on dope. She looks like a mother that’s very upset that her son is missing. Why is it any of your f…king business if she does dope or not? Did she stuff a straw up your nose? Does drug use mean a mother can’t look for her missing child? I hate to damage your fragile world view but ALOT of people have done drugs. He DID NOT know exactly where she was. He has a mental illness and did not even know where HE was. I think you know where I’d like you to shove your sanctimonious comments. Also, what kind of total asshat says that something this horrifying is “all very trivial?” I sincerely hope you never know the hell of thinking one of your family members was murdered and burned beyond even being able to tell if the body was male or female. Couldn’t have said it any better myself, 44639. And exactly how SHOULD a grieving mother who hasn’t slept or eaten normally in days look? “On drugs?” Try exhausted, heartsick, and terrified. correct – arrested at the airport yesterday – 2 felonys (no bail) WTF is LoveTheAV? oh i see.. .com at end..
Was he trying to leave the country to get away from mom?